Every 10 years, the government conducts a census of the U.S. population to get a count of how many people live in each state. The results of the census help to determine each state's congressional representation and how much federal money each community receives. Additionally, it provides a better understanding of American demographics. 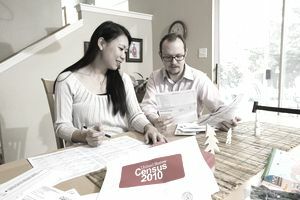 The next census is scheduled for 2020 and will require thousands of census takers to complete. Apply to be one of them, and you could enjoy a temporary boost to your income. Census takers go door to door to verify the residential addresses in their community before the 2020 census is mailed, and then later return to the streets to interview any residents who haven't responded to the census mailing. A census taker must ask a wide range of questions that some people may find invasive. For example, they must ask about each individual's ethnic background, marital status, income, and place of birth. Each of these questions helps the federal government to make policy and budget for needs. While the individual answers to these questions are confidential, there are a variety of situations in which it might be difficult to elicit answers. be a U.S. Citizen or a legal permanent resident or noncitizen with a work visa and a bilingual skill that no available citizen possesses. have a valid Social Security card. have a valid driver's license if you'll be working in the field. complete four days of training. The Field Employee Selection Aid test consists of 28 questions designed to measure the knowledge, skills, and abilities required to perform census jobs. The test is multiple choice and lasts about 30 minutes. The questions you answer allow the census administration to assess your ability to read and follow a map, accurately record information, do simple arithmetic, and complete basic clerical tasks such as alphabetizing and reading for information. You'll also be asked questions that check your understanding of concepts included in the census questions. While the test isn't extraordinarily difficult, it is challenging. Even college graduates can benefit from reviewing a practice test. Each state has its own testing procedures, so you may want to contact your state census office for the most relevant practice test. Census takers generally work between 20 and 40 hours a week for 5-10 weeks and are paid on a weekly basis. You're paid for travel and training, but you must be willing and able to work evenings, weekends, and in poor weather conditions. According to the census website, census takers are given several neighborhood blocks called "assignment areas" and given a map and other materials to do the job. The pay rate varies by location, but it typically is more than minimum wage. To determine the hourly rate for your area, visit job opportunities by state. Then, select your state from the drop-down list. Call the U.S. Census Bureau job line at 1-866-861-2010 to schedule an appointment to take the employment test. Then, print a copy of the Census employment application and Form I-9. Be sure to bring both forms to your appointment along with all required forms of identification. To increase your chances of landing a job, apply early. Hiring starts in February 2019, and most positions will be filled by May 2019. It's also a good idea to download and take the Census practice test before your scheduled appointment.